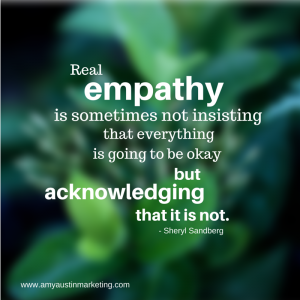 Real empathy is sometimes not insisting that it will be okay but acknowledging that it is not.Showing empathy in healthcare and other sensitive situations can make a significant difference in our relationships. Many of you have read the powerful statement Sheryl Sandberg released regarding the support she received in the 30 days after her husband’s unexpected passing. I was struck by this line and the thoughts that followed. She went on to say that asking “How are you doing today?” instead of just “How are you doing?” was a better question to ask given the situation. Social media has been flooded with shares and graphics of key lines from her statement. We all have different reasons for relating to one statement or another. For me, it was this observation about empathy and how to show support for friends and family. It reminded me of an article I read a few months ago concerning research on speaking to people with cancer – specifically the use of terms commonly associated with war or battles to describe their situation. The article specifically called for a change in terminology. In trying to find the original article, I came across several more on the same topic that I’ll link at the end of this post. The use of combat terms to describe a person’s experience with cancer dates back 40+ years to President Nixon. I can understand why “fighting cancer” seemed like the best choice – at the time there wasn’t much known about cancer other than it was challenging. It seemed like a fight or an uphill battle. After all this time, research and advancements in the care of cancer, you’d think our society could have found words to be more empathetic to those with cancer or other serious illness, or who have faced a significant loss, as Sheryl Sandberg has. I’ve spent the better part of the last four years dealing with several cancer diagnoses. First was my father, then a close friend faced a potential diagnosis, a high school classmate, a client and now my mother, who was given a stage 4 cancer diagnosis in August 2014. As a result, my sensitivity to the patient experience and empathy in healthcare, the care given and the emotional toll it takes on everyone (including caregivers) has been fine-tuned. My mom was referred to as a cancer victim. News media continually use combat terms when covering stories about cancer – “win the battle”, “fought a good fight”, “attack the cancer.” Even Ms. Sandberg mentioned a conversation with a good friend dealing with a cancer diagnosis – and how the worst thing a person could say was “It’s going to be okay.” While this does not include a combat metaphor, the statement implies a promise that cannot be guaranteed. Palliative care is viewed as “giving up the fight.” Even survivor, a positive term, is connected to wars and battles. Research has shown that labeling cancer as an enemy puts people on the defensive, shifting the focus of care to a battle rather than preventative behaviors that involve limitation and restraint. Individuals asked what they would do to “fight off potential cancer” responded with less self-control or preventative behaviors than those who were asked what they would do “to prevent cancer?” War or battle needs an attack in order to stop. Self-limitation or preventative measures are not part of that equation. When I hear these combat metaphors, I stop. I cringe. I immediately think of the individual person and wonder how they feel about the terms being used to describe them. How would I feel? Some find strength in the idea of fighting a battle against cancer. But there are many who do not. How can we learn to be more empathetic to situations others are going through that we, individually, cannot understand unless we’ve been there, experiencing it personally? I wouldn’t understand it myself without having gone through every appointment and treatment with my Mom. I think Ms. Sanberg offers excellent advice and insight for all us to keep in mind to become more empathetic and how to best show support to those we care for. Listen to how your friends or family talk about their diagnosis and follow their lead. They will tell you what they need.